Thiel: Griffey, Ichiro . . . and now Mitch Haniger? A 10-5 win gave the Mariners the series against Miami and a 6-3 homestand. 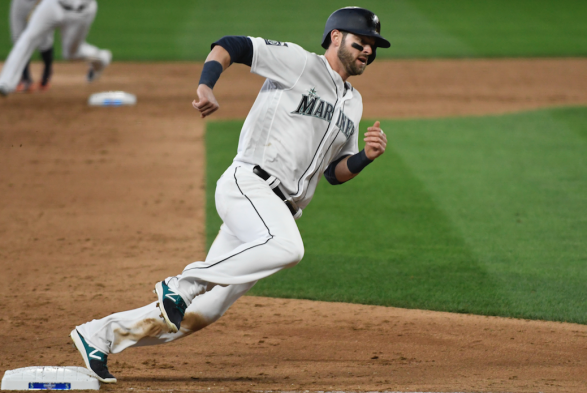 The game also completed a star turn for rookie Mitch Haniger and perhaps a fine Seattle farewell for Ichiro, who hit a home run. Does Ichiro get the next statue? Or does Edgar Martinez? How about Felix Hernandez? The answer was easy: Mitch Haniger. If baseball is about the here and now — and with 162 games, how can it not be? — there’s no doubt that the rookie right fielder deserves an immediate bronze casting. Wednesday afternoon, he had a double, two singles, a walk and four RBIs in a 10-5 triumph that concluded a 2-1 series victory and a 6-3 homestand. He’s the single biggest reason the 7-9 Mariners have demonstrated the resiliency to come back from a 2-8 seasonal start, as well as leading the biggest run production of the young season 15 hours following the worst production — a 5-0 loss Tuesday night in which they had a single hit. By who else? Haniger. He leads the team in average (.324), runs (15), home runs (four), RBIs (15) and walks (11), and has a 13-game hitting streak in which he’s hit .380. So Felix Hernandez, how would you pitch him? “I’d walk him,” he said, grinning. The way Hernandez began the game against Miami, a walk would have been a blessing. By his count he gave up five hits in his first six pitches. Manager Scott Servais claimed four in seven. Whatever it was, the Mariners were down 2-0 and that modest disadvantage was only because LF Jarrod Dyson caught a fly for one out and threw a bullet home for a tag-out and a 7-2 double play. The start resembled another of the King’s fall-off-the-earth outings that spoiled his 2016 season. “You look up in the first inning and wonder how we’re going to get through this,” Servais said. Whatever it was, it didn’t last. Hernandez endured into the seventh inning in part because the offense took off against Marlins starter Edinson Volquez, who was 5-0 with a 2.66 ERA in eight career games against the Mariners. Seattle scored once in the first, twice in the second, once in the third and four times in the fourth. Servais’s flop sweats were decidedly premature. Then he allowed himself to gush about Haniger. “Outstanding,” he said. “Can’t say enough about him. The at-bats, the walks, the big hits, getting ahead in the count, understanding situations . . . he’s been huge for us. “He’s grinding through his at-bats. The guy in Anaheim (Mike Trout) was pretty good too when he came up. (Haniger) understands who he is, his swing, where he is on the team, and he’s going out and having fun. A guy who preceded him in Seattle’s right field, Ichiro, might have finally relaxed too. Entering the game 1-for-15 as the Marlins fourth outfielder, the 43-year-old singled in the second inning off his former teammate, Hernandez, then topped it in the ninth. Off reliever Evan Marshall, Ichiro stroked a first-pitch fastball that went deep into the right field stands. Since the Mariners were up 10-4, the 115th home run of his U.S. career received the heartiest cheer perhaps ever given an opponent. Now the race is on to see who gets the next statue. If Haniger carries the Mariners into the playoffs for the first time in 16 years, maybe he beats them both. Dipoto’s guys are looking very promising so far. Segura was impressive before he got hurt, and Haniger is on Fuego. These are the kind of guys the M’s usually give up instead of get. It’s encouraging. Nice to see Ichiro hit a dinger today. He is easily one of the greatest players of all time, and he didn’t even start his MLB career until age 27. First base is looking a little weak with Valencia/Vogelbach. But if Smyly were healthy to make Miranda the No. 5 starter instead of Gallardo, the rotation looks more solid. You’re Segura/Haniger looks so far like the deal of the offseason. Gallardo is appearing to be the weak link in the rotation, but he is still adding innings. His outing in Oakland is incredibly important, Billy Bean’s Boys are hitting the baseball. M’s need 3 out of 4 to have a prayer of keeping pace with Houston, the obvious team to beat in the division. Haniger and Motter have been loads of fun to watch. Rest of the team is starting to respond, except for Valencia. Oakland will be interesting, maybe pivotal for him. When Segura comes back, Motter may need a place in the lineup, 1st base looking pretty doable. Motter has played three career games at first base. First good pickoff throw that ends up down the right field line will be on you. Come on Art, we all know Haniger got’s to start Mariner immortality with a bobblehead. In our increasingly time-compressed culture, I don’t see why both can’t happen on the same day. Is he the next Ichiro, or the next Brian Turang? Only 600 at bats will tell.